For many of us, the upcoming months are full of conferences. It’s an exciting time—this flurry of activity can easily make one want to learn everything! Meet everyone! Network everywhere! But all too often, conferences can leave us feeling overwhelmed with information. 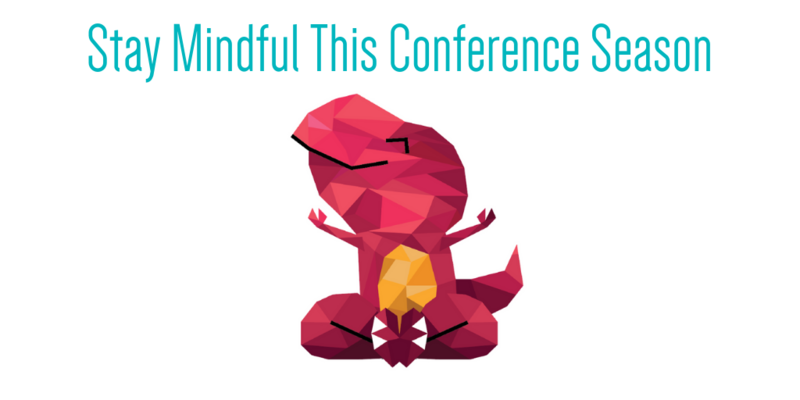 Our 2018 theme, mindfulness, is a great tool for getting the most out of conference season while also keeping calm and taking care of yourself. Our overall advice is that less is more—a genuine interaction with a new connection is more valuable than quickly meeting 10 people, and skipping a session here and there can help you be fully engaged in the sessions most important to you. We plan to incorporate several of our mindfulness activities into an exciting partnership with the American Evaluation Association. At its conference this fall in Cleveland we are designing and hosting a mindfulness space for attendees to refresh and reflect between the many sessions and events. Regardless of what conference you’re attending, here are some tips that help us be present, feel prepared, and get the most out of every conference. Before you leave for a conference (and bid adieu to your free time for several days), take time to set your principles and priorities. In what topics are you hoping to build skills? What do you want to learn about? Is making new connections more important than attending every session? Thinking about your answers to these questions helps you prioritize and make mindful decisions in the frenzy of a conference. Similarly, while you’re completing your conference circuit, set intentions. To do this, take a moment before your session and reflect. How are you feeling going into this session? What do you want to bring to this experience? What do you hope to get out of it? A helpful way to cue oneself to do this is by finding a physical activity that will remind you and connect your body to your intention. For example, when stepping into a conference room, take a deep breath: on the in-breath, locate your intention; on the out-breath, begin to carry out your intention. An example of an intention is, “I want to listen openly and without judgment during this event” (adapted from “Eight Mindfulness Practices for Effectiveness at Work,” Tim Burkett, Ph.D.). Then, take time at the end of each day of a conference to reflect. It may feel like another task to fit into your packed schedule, but journaling or processing with a coworker can help you articulate and hold onto the “aha moments” and insights you picked up from the day. Pay attention to your physical needs—if you aren’t feeling well, you won’t get the most out of your time. Give yourself time to take a walk between (or even during!) sessions. Bring a refillable water bottle. Pack snack bars! It’s just as important to pay attention to your mental and emotional health. We’ve all hit that wall during conferences when we can’t absorb any new information. Preempt that by monitoring how you’re feeling and taking quiet time, going for a run, or just checking out as you need to. Finally, when all else fails: deep breaths. You can do this!